Can't attend? Follow Sunway GEO Avenue to know of future events! 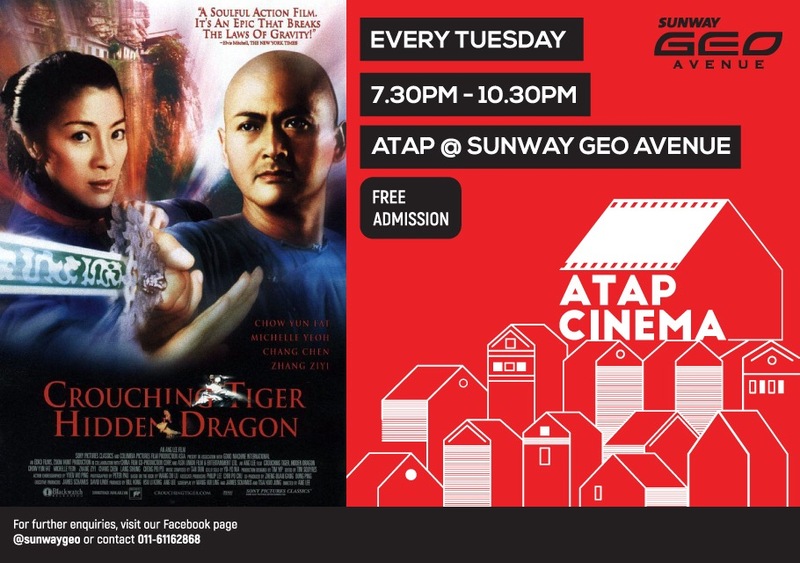 Atap Cinema is back next Tuesday to screen 'Crouching Tiger, Hidden Dragon' or '卧虎藏龙', an internationally co-produced wuxia film, based on the fourth novel, of the same name, in the wuxia book series Crane Iron Pentalogy, by Chinese novelist Wang Dulu. The set in the Qing Dynasty during the 43rd year (1778) of the reign of the Qianlong Emperor and is directed by Ang Lee, featuring an international cast such as, Chow-Yun Fat, Zhang Zi Yi, Chang Chen, and our very own Tan Sri Dato' Seri Michelle Yeoh! Signup now for FREE and receive FREE vouchers of CookieNation Malaysia and a special gift from us! Event is free so sign up soon!